He is holding a banner reading “Latins do it Better”. What does “Latins do it Better” mean? What kind of message he want to convey?? Sorry for my non-HK question. Are there any silent (rather than just enclosed) orders of nuns that this one could join? Actually, I’d settle for an enclosed order! was that thing dancing on the street? It looks like a cd player is on the sidewalk. 4. There wasn’t room in Purgatory, so she has to serve it on earth. PLEASE pray for her. And I thought things couldn’t get more mind-blowing. The only way it could be more freaky to me if it had been walking down my street. 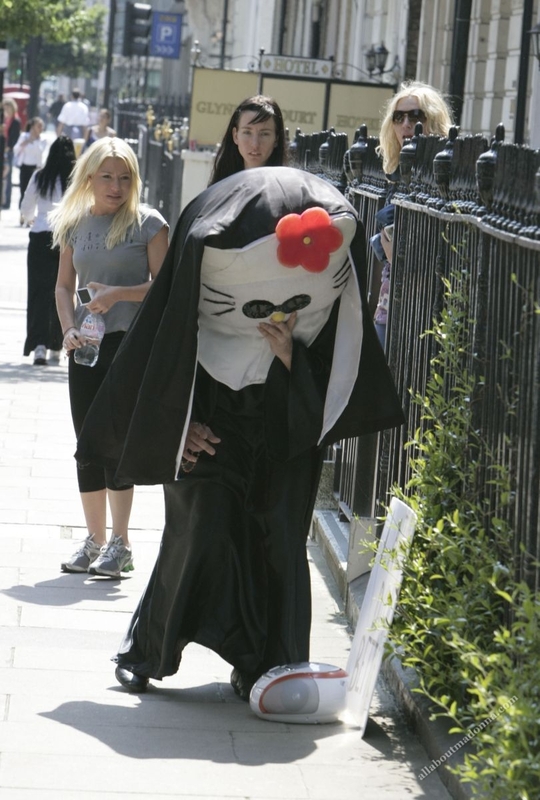 hello kitty in a nun outfit…. what a holier way to glorify the kitty… NOT!!! Almost… Almost looks like it’s trying to flip us all off. Well, if you had ever wondered what your face would look like while undergoing a Hello Kitty-induced brain aneurysm, then pay special attention to the ladies in the background. By way of explanation as to what is going on there, I’m not sure, but I have a feeling that this is the sort of thing the Patriiot Act should swoop down and take care of. if not…any mental asylums nearby? rehab? can this be consider as a blasphemous act?? So much for me ever wanting to be Catholic. I think the funniest thing is that one of the people in the background is Madonna, and that’s completely unimportant. Blasphemy, against whom? I didn’t think it was possible to blaspheme against a specific Church, only against a God (or Their prophets maybe). AIUI nuns aren’t even Roman Catholic avatars, never mind Christian avatars, and Hello Kitty isn’t actually a recognised religion! Oh and brien, are you saying the blonde in the shades is Madonna? I hate nuns but I love Hello Kitty. The girls in rhe background look FREAKED! The blonde w/ the tennis shoes & water bottle is cute. If I saw this person on the side of the road, I would HIT them with my CAR!!!!!!!!!!!!!! I can’t believe someone actually took the time to make this costume. I wonder if she finally overdosed on her precious pepto?? But all the same, that’s just lacking in any form of decency IMO. HK-fans really do have twisted minds. Is that a guy in that suit? Obviously this is hazing of a Drunken Frat Boy (probably Inspired by this site). He needs to Convert people to a Hello Kitty Religion to Join the Frat. We know that this is true because I can’t think of any hazing more embarrassing and psychologically traumatizing than having to wear a Hello Kitty Nun suit. Ok this is even taking it to far for this HK freak!! And it does look like they are either barfing or getting ready too….who knows?! Wish it came captioned already!! I love the WTF? looks on the by-standers! Those are great! I suppose it is something different for the priests to chase. Perhaps the altar boys can take a break…..
things together isnt a good match. omfg!!! is this person serious??? that is desturbing, not funny in anyway, unless it IS a frat boy, then it’s f hilarious!!! but seriously on a religious level this guy’s SO going to hel?!?!? i hope. Ok , yes it`s true, Latins do it better lol, but perhaps this is not the right way to promote it. The funny thing is , if this Kitty would walk around in here in Japan, no one would blink, Japanese people would scream KAWAII NE, and kids would be posing with it. HK Nun isn’t being sick – she’s coughing up a hairball! I am horrified, yet, almost turned on. Sensual Hello Kitty Madonna Nun…wow. I feel really insulted by this. I find this incredibly offensive. Dunno why. throughout the video i was silently rooting for someone to mug the creep in the “hello kitty” costume. Very cute, though I do not understand what message she is trying to give. I love Hello Kitty and it doesn’t distract me from religious duties, but its new to me to see someone dress up as a nun-style Hello Kitty. I think the story needs to be explained here.